All transactions are safe and secure with a reliable history in online purchasing behind each of our associates. 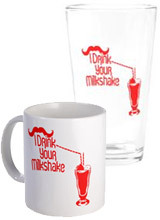 Buy the I Drink Your Milkshake Glass and Mugs to own There Will Be Blood clothing and merchandise. This unique selection of I Drink Your Milkshake glasses and drinkware includes steins, coffee mugs, water bottles, shot glasses and the pint glass shown on the left. The latter is perfect for making a whipped cream capped milkshake with a cherry on top. Just make sure that you use an extra long straw to drink up your friend's shake in addition to your own. That's how Daniel Plainview would do it. In addition to the I Drink Your Milkshake Glass and Mugs above, browse the There Will Be Blood Clothing Gallery for more apparel like men's and women's clothes, kids shirts or hoodies.